The all-new 2019 Ram 1500 is a show stopper, with styling, interior comfort, capability and performance that’s second to none. There’s only one way the 2019 Ram can be made better, and Ram has done it, with the 2019 Ram Rebel. Big, burly, packed with attitude and off-road muscle, Ram’s flashy flagship 4×4 wasn’t designed to be ignored. Want to buy a 2019 Ram Rebel in Rogers, Arkansas? Then stop in today at McLarty Daniel Chrysler Dodge Jeep Ram Fiat of Springdale, or check out our big selection of 2019 Ram models online right now! MUSCULAR DESIGN: You want a truck that reflects who you are and what you value. If what you value is strength, reliability and can-do attitude, the truck you’re looking for the the 2019 Ram 1500 Rebel. Building on the groundbreaking styling built into every 2019 Ram 1500, the Ram Rebel adds in a heaping dose of rock and roll. Up front, there’s a vented powerdome hood to up the already muscular front fascia, along with a signature and model-specific take on the front grille. Blacked out fender flares and trim fill out the look, along with model-specific 18-inch alloy rims running 33-inch tires. UNSTOPPABLE CAPABILITY: Since the days when the legendary Dodge Power Wagon rolled into battle with America’s armed forces, Ram 4×4 trucks have been synonymous with unstoppable off-road capability. That tradition continues with the 2019 Ram Rebel. Featuring those previously mentioned 33-inch meats, the Rebel rides high with a factory lift over the standard 4×4 and monotube suspension dampers with rear external reservoirs by racing supplier Bilstein. Underneath, there’s a host of bomb-proof components, including electronic locking front and rear differentials, BorgWarner on-demand transfer case, and hardened steel skid plates to up-armor the front suspension, steering box, transfer case, transmission and fuel tank. LEGENDARY PERFORMANCE: Ask any gearhead to name the most legendary muscle car builder, and chances are you’re going to hear one word: Mopar. 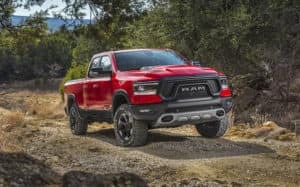 That legend for low-drama high horsepower continues in the 2019 Ram Rebel, Standard power is the 3.6-liter Pentastar V6 with the revolutionary eTorque mild hybrid system, which constantly sends power to a suitcase-sized battery pack in the cab, returning it to the engine whenever the system senses a need for a low-end torque boost. Long story short, the base V6 delivers a robust 205 horsepower and 269 lb.-ft. of torque, plus fuel-sipping fuel mileage. For even more fun out on the trail, step up to the legendary power of the 5.7-liter Hemi, with 395 horsepower and 410 lb.-ft. of torque, backed by a smooth-shifting 8-speed automatic. It all adds up to maximum towing of up to 11.610 pounds. Packed with incredible design, legendary performance, and unstoppable off-road capability the 2019 Ram 1500 Rebel is the truck for those who expect more from a pickup, especially out where the pavement ends. Want to buy a 2019 Ram Rebel in Springdale, Arkansas? 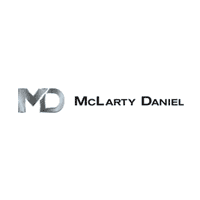 Then stop in today at McLarty Daniel CDJRF of Springdale for a test drive, or check out our big selection of 2019 Ram 1500 models online right now!